Experience Egypt tiptop attractions in a private day trip to Cairo from Hurghada by plane to discover the ancient Egyptian civilization in one of the seven wonders of the world, Giza pyramids complex including, the Great Sphinx, the Great Pyramid, Valley Temple, then move to explore the ancient Egyptian artifacts inside the Egyptian Museum, also get the chance to visit the oldest bazaar in the Middle East “Khan El Khalili“, finally catch your flight back to Hurghada & transfer to your hotel. Book Now! Private Egyptologist tour guide throughout the day tour. Mineral water and soft drink on board the vehicle during the day tour. It is the oldest and largest of the three pyramids of Giza plateau and the only one to remain intact from the 7 Wonders of the Ancient World, it was built by King Khufu and the height of the great pyramid is 147m, the number of stones used in construction is 2,300,000 and it took twenty years to be built. The Sphinx belongs to King Chephren is the largest statue in the world, standing 73 m. long, 19 m. wide, and 20 m in height. It is the oldest known monumental sculpture. No visit to Cairo is complete without a stop to Khan EL Khalili bazaar, one of the most famous and oldest bazaars in the Middle East. Finally, we will transfer you to Cairo Airport for a flight to Hurghada and then transfer to your hotel to end your day trip to Cairo from Hurghada by plane. I can not say enough about the wonderful day I had in Egypt! Traveling as single solo woman, I visited 5 countries in 20 days, and I am so glad I ended it with a bang with Egypt Portal Tours!!! Egypt gets a bad reputation, but it is far from the truth!!! My experience with my tour and driver, along with everyone we met on the tour and the people in the establishments, and at all the locations were attentive, secure, kind, respectful, and extremely knowledgeable and accountable! I landed in Egypt Nov 07 and had a 24 hour stay in the country where I would fly out Nov 8 later in the evening, so wanted to make the best of it by doing a tour. From the time I touched down, I was welcomed with such hospitality, by Anter at the Airport, an affiliate with Egypt Portal Tours! He assisted me with my getting my Visa and walking me to my transport vehicle! Once I was at the vehicle I met my tour guide Mohamed Elshemei and driver, Mini, who were so accommodating from start to finish; complete gentleman. I did not have to worry about my luggage or personal items, hotel accommodations, portable MiFi, trip itineraries, and/or transportation; everything was situated and reserved for me! Truly 5 Star treatment! The hotel was wonderful and their breakfast was phenomenal (I signed up for the 5 star hotel). The facility was secure and the service was impeccable! Mohamed really focused on taking me to key landmarks that Egypt is known for, as well as, took me to some an amazing restaurant for lunch and wonderful shops, where I purchased quality merchandise! We also checked out the oldest market place at the end of the day which had a great energy, as the sun set! The streets were filled with people, many being families just enjoying the shops and local food! He was very kind, honest, and sincere, which speaks volumes about his character and the way him and his colleague Mini, provide top notch customer service! I plan on coming back to Egypt with my family, and will definitely be rebooking with my guide, Mohamed Elshemei and the Driver MINI next time! So if you have any doubts about visiting Egypt, trust and believe that it is Safe, Beautiful, and truly a place to make lasting memories!!! We came to Egypt to dive in the Red Sea but we still wanted to see the pyramids. I did my research and found Egypt Tour Portal. They were extremely responsive to emails and put together the perfect tour for us. I try to always take private tours so they can be customized a bit. We were picked up at our hotel at 4am and dropped off at the airport for our flight to Cairo (included in price). In Cairo we were met outside the airport by our guide Ismail (I might be spelling that wrong – he went by the nickname Smile). We drove though Cairo to Giza and arrived at the Pyramids pretty early in the day. Over the last few years I have heard that it has become over crowded with stores and fast food everywhere. I did not find this to be the case at all. There is a small group of shack vendors and camel rides near the Pyramids and the town has definitely spread close to the Sphinx but it still was amazing. Maybe it was the time of year but we did not feel overload by tourists at all. We went to a Papyrus gallery where I brought home two beautiful pieces. We visited the Egyptian Museum and hope to go back when the Grand Museum is finished in 2020. We ended our day at Khan El-Khalili the Cairo Market. This was not part of the original tour but we really wanted to go (hence why I book private tours). Smile was a fantastic guide, walking us through the market then giving us time to explore on our own before heading back to the airport for our flight back to Hurghada. If you are looking for a great company to book your Egypt tours with these guys are great and ask for Smile he was fabulous! I was guided by the amazing tour guide Sameh, he is very knowledgeable and very professional! This is my first time in Cairo and also the best day in Cairo thanks to my private tour guide Sameh. We visited the Pyramids and had the dinner cruise on the boat. It was lots of walking in the Pyramids area, make sure you wear a comfortable shoes as u’re gonna walk quite a lot and wear sun cream to protect ur skin from the heavy sun. I’m so glad I was served by Sameh, because he is not only a professional tour guide, also a skillful photographer. He had taken lots of fantastic photos and videos of me! And on the cruise was one of the best memories. I love Egyptian music and songs. I told Sameh I wanna dance to the music the live band played, he immediately communicate with the staff there, beautiful videos was taken and I had a chance to talk to the amazing and hilarious Tanaura dancer Hussein Mansour. And there is a small thing that I would like to mention here, is that Sameh he is such a gentleman always open the car door for u to enter every single time we use the car. I was very surprised cuz’ usually Arabic guys are not doing this things. Last not the least, I’m a woman traveling solo to Cairo. Its safe to travel with Sameh, cuz he will be always at ur back. Very respectful and professional from the beginning till he dropped me to the airport. I wish he could company me to the tour from Luxor to Aswan. If I have friends who haven’t visited Cairo, I would highly recommend them to choose Sameh. Very nice daytrip, you see all the Caïro essentials. The guide was polite, helpful and informative, telling you everything there is to know during the trip. Although they are optional, expect to pay some extra cash for activities that make the experience complete. My family just had a fantastic day in Cairo, we were picked up at 2:30am by private car and we are right now returning to Hurghada. We are all very tired due to the long distance ( 5 hours each way) but it worth every second. Abraham was our Guide and I can’t thank him enough for all the kindness and help. I would definitely do it again and really recommend this tour. Let me start by saying, we found Egypt a safe and friendly place to visit. At the all the airports and main tourist sights, security is tight and visible ensuring safety. I last toured Egypt as a single man in 1993 and made this trip to Cairo with my wife and 2 teenage daughters. The country and itsancient sights and the Museum remain as fascinating as ever! We booked a day trip to Cairo with the Egypt Tours Portal after having read their Trip Advisor Reviews. We were not disappointed. To visit Cairo from Hurghada on a day trip it’s best to fly; however please be aware it can be a very long and tiring day. We left our Hurghada Resort at 3:00 am and arrived back at 2:00 am the following morning! We were met at Cairo Airport by our guide Mohammed Al-Shemei. It was a pleasure to spend the day with him and our driver, Ali – starting the day by buying us a traditional Egyptian Breakfast of Falafel, Spicy Beans and Pomme Fritte Pitta Bread kebabs. We started with a visit to the Grand Mosque of Muhammad Ali followed by the Egyptian Museum, followed by a trip to Giza to see the Sphinx and the Pyramids of Giza. Mohammed is a knowledgeable guide and pitched the information at the right level to keep us interested and wanting to learn more ; we were a family of 4 with 2 teen-aged daughters. 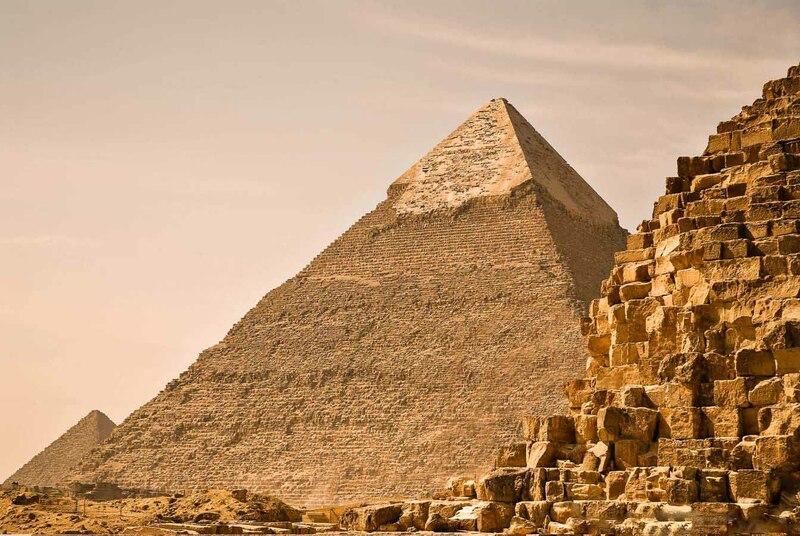 A visit inside the Great Pyramid of Giza also known as the Pyramid of Khufu or Cheops is a must, although it’s at an extra cost! Included was a traditional Egyptian buffet lunch at the Cleopatra Restaurant, in the shadow of the Pyramids. This was disappointing and I would recommend that the Tour Company find a better alternative to this even if not in sight of the Pyramids. The day was not rushed and Mohammed, like all guides, took us to the usual tourist trap shops of a bazaar selling curious, gold and souvenirs, a traditional Egyptian Oils/perfumer, a Papyrus demonstration and shop and a textile shop. These were all over-priced and the guides were evidently paid a commission on any purchases. As our flight back to Hurghada was quite late, we asked if we could fit in the Sound and Light Show at the Sphinx. Mohammed was able to accommodate this, which is at an extra cost but I highly recommend it if you have the time. I would recommend the Company Egypt Tours Portal as well as their guide Mohammed Al-Shemei for a day trip to Cairo. However, I would advise that you plan the day with the company in advance and agree the extras and places you would want to visit in order to make the most of your day trip. Just do it! Honestly no regrets! Booked at last minute and all arranged immediately via WhatsApp. Hotel pickup time, flights arranged, welcome at Cairo by tour company spot on! Our day was awesome, with special thanks to our guide Reham! The best tour guide we have ever had! Great knowledge and makes your tour fun! She also takes awesome family photos and fun ones at the pyramids! And the lunch was so good! What an experience! Thank you Egypt Tours Portal and Reham our guide and Mohamed our driver for making our day an incredible experience. Early start for our flight to Cairo and then, just WOW! Our tour guide, Emy, was just fab and made the day extra special for us. Her knowledge was great and her photographic skills have given us memories to last a lifetime. Our driver was amazing on the roads of Cairo. Highly recommended, thanks. Where to begin…a friend and I booked this tour for my 40th birthday as I’ve always wanted to see the pyramids and today it was a dream come true! We were picked up from our hotel at 4am by Mohamed who was really friendly and helpful both in teaching us a few Arabic words at our request and advising us on getting our flight. Check in went smoothly and we found that trying out our new Arabic words got a good reception and a few smiles. The Egyptian airlines flight was great, even got served a free drink and some biscuits despite the very short flight. We were met off the plane by Mohamed Elshemei and Minii who instantly made us feel at ease and we set off to start our day in Cairo. Mohamed was incredibly knowledgeable with his explanations of landmarks and buildings as well as the pyramids and their history. I felt that we had a good balance of information from Mohamed and time to take photos and take in the amazing pyramids and the Sphinx. After the pyramids were a couple of stops at an essence maker and a papyrus maker. Mohamed was great in explaining the expectations and that we were under no obligation to buy anything. I think he helped negotiate with the essence maker as we bought some menthol which I would definitely recommend for clearing the head! We chose not to buy anything in the papyrus shop and although the lady who had been demonstrating the process to us was disappointed that she didn’t get a sale she was professional throughout. Lunch at an Egyptian restaurant with a view of the pyramids was an amazing experience. Mohamed and minii ate with us which was great, and the food was delicious. So many different dishes with fresh ingredients all beautifully presented and served by friendly waiting staff. I hadn’t wanted to make a big deal of it being my birthday but Mohamed and Minii at the last minute arranged a cake which although I was embarrassed it was a lovely touch and I really did appreciate it! Next it was on to the Egyptian museum, but first a few words about the roads/drivers. It all seemed like utter chaos to me and I certainly wouldn’t drive on the roads of Cairo for all the treasure in the tombs! Minii was ace though and we felt like we were in safe hands on the seemingly lawless roads. Another thing about the journey was the music, I requested some Egyptian music and enjoyed a great mix of music which was great. So the Egyptian museum, massive and truly wonderful. Again it was great to have Mohamed imparting his knowledge. The museum is so big that having the highlights pointed out and explained was really useful. I would loved to have spent all day there really but the couple of hours we had was well spent and i feel that we got a good all round tour. We chose to go back to the airport after the museum (although we would have had time to squeeze in a quick boat trip on the Nile we chose to save that for our upcoming Luxor trip). It was a very long day and for 2 brits not accustomed to the heat we were ready to enjoy air conditioning for a while. There was some slight confusion when we returned to Hurghada about meeting the other Mohamed to take us back to the hotel. A quick call to the office and this was sorted and less than 5 minutes later we were on our way home. Without exception everyone we met today was professional, friendly and made us feel welcome. It has been an amazing day and a fantastic experience and I highly recommend this tour and Egypt tours portal to anyone considering it. My friend and I recently took the 1 day flight tour with the Egypt tours portal. From start to finish we received first class service and most definitely got our monies worth. I booked this trip for my friends 40th birthday, following reviews I’d seen in here. The booking process was simple and straightforward (so much so I was sure something would go wrong!). Many tour operators will warn you to book tours through your hotel (for safety reasons etc) however this was cheaper and offered much more for your money. The day began with an internal flight from hurghada to Cairo at 5am. All flights and transfers to and from the airport were taken care of. We were met at the airport by Mohammed Elshemei (our tour guide for the day) and Minii (our driver). On our way to our first stop (the pyramids) we were treated to an authentic Egyptian breakfast of falafel and beans..although the mania of Cairo’s roads had me feeling a little car sick, the one bite of it that I had was delicious!!! At the pyramids & sphinx Mohammed made sure we got to the best view points for pictures but also gave a really interesting run down of the history of all three pyramids, including discoveries that have only just been made which was truly fascinating. I’m also glad that that by getting us there at 8am the sun hadn’t got too hot and it was quiet enough to really appreciate what you were seeing. After the pyramids we went to an essence shop, which sells some beautiful Egyptian oils. Mohammed stayed close-by throughout so we never felt left or at the mercy of the shop. He made it clear that we were under no obligation to buy, but when we did, he got us a couple of little extra gifts to add on (for free). It was a really enjoyable experience and we never felt like anyone was giving us the hard sell, or making us feel uncomfortable. After the essence shop we went to the papyrus centre. We watched a demonstration on how to make papyrus paper which was incredibly interesting and informative. Mohammed gave us space to enjoy the demonstration and the art, however was soon on hand when it looked like we might need help bartering. After the papyrus centre Minii and Mohammed took us to an Egyptian restaurant for lunch. They made sure we had a window seat so we could see the sphinx and pyramids from our table. Mohammed and Minii had lunch with us, which was lovely, and the food (whilst being enough to feed 20) was exceptional. Really fresh and tasty salads mixed with succulent meats and a fruit and dessert platter to end. Mohammed had found out it was my friends birthday that day and even managed to organise a few artisan cakes and a round of happy birthday (in Egyptian) as a last minute celebration! This was a really genuine and lovely thought. After lunch Mohammed gave us a tour of the museum. He made sure we saw some important pieces that were dotted all over the enormous building (that we most likely would have missed without him) and his knowledge and passion was immense. After the tour it was back to the airport. We could have had time for shopping or a quick boat tour on the Nile, but having had just a few hours sleep we were ready for a coffee and a sit down!! There was a little confusion about meeting our trabsfer back to the hotel however after a 7 second phone calls to the tour operator we were met within minutes. We did even need to give our names on the phone, the operator was in it straight away. I came to cairo 10years ago and remember it being pretty overwhelming, and always feeling like you needed to be on guard….today was a completely different experience and I felt like I could relax and really enjoy the experience. I cannot recommend this tour enough…the day was one I’ll never forget and the value for money is amazing. When I booked this tour for our family (my husband and I with four kids: 10, 12, 15,16) I made the down payment and received an email with a page to print out as our airline tickets and the instructions that we would be picked up at our hotel at 4 am for our 5:30 am flight. My husband and I were joking about whether or not the tour company was legitimate and whether we would actually be picked up, but shortly before 4 we were outside of our hotel and the van to transfer us to the airport was already there. We fought our way through the adventurous domestic flights terminal at Hurghada airport and after a short flights we were in Cairo, but still wondering if we would actually be met there! 🙂 We were met outside by Mohamed Elshemei, who had a clean, modern vehicle with a driver and we felt right from the start that we were in good hands. We made our first quick stop at the Muhammad Mosque in Cairo, but it was still before the opening time of 8am so the guards did not want to let us in. But Mohamed “convinced” them to open up the gates and we had a wonderful close-up view of the beautiful green dome. We then drove across the Nile where we stopped briefly to get out and take some photos. We then arrived at the Giza Pyramids shortly before 8am so that we were the first tourists there and got to enjoy these magnificent structures in the early morning light. Mohamed was very knowledgeable about the history and made some great family photos of us. We then toured the Sphinx memorial. Next we visited a precious oil manufacturer, which was owned by the government and we expected it to be very touristy, which it was, but it was still a memorable experience for us all, as we were given mint tea and allowed to smell and apply these oils and scents. From there we stopped off at a similar government run fabricator but this time of paper from papyrus. It was interesting but we felt pressured to buy something and that was very unpleasant, added to the fact that we were getting very hungry. So as soon as we told Mohamed we’d had enough, he whisked us away to lunch at a restaurant with views of the pyramids. After lunch we visited the Egyptian Museum and Mohamed brought us quickly through be stopped at the highlights and explaining the history to us. By that point we were all really exhausted after having woken at 3 am, so our attention span we short, but we visited the mummy display which was amazing. While we were in the museum, Mohamed had ordered necklaces for us of our names in Egyptian Hieroglyphics which we picked up on the way back to the airport. A quick flight home, still wondering if our ride from the airport back to the hotel would actually be there. It was. And we were very, very happy that we made the trip. For a family of six, it was not cheap, but it gave us memories to last a lifetime. Amazing day in Cairo. Excellent organisation from the pick-up yo the end of the day! Private tour guide and driver with great knowledge of their city. Worth it, taking the early flight from Hurghada for the day. Reham and Boudi were really nice and fun. We appreciate to spend the day with them. Great to do this trip with a private guide and driver. Makes the experience effortless. Our guide was very informative and very pleasant. As well as the driver. Could not fault them. Everything was on time and seamless. Being in such a group means you are hassled nowhere near as much as in a large group. And of course your day is tailored around what you want to do. Only reason not to give this 5 stars is the restaurant for lunch. Not to our taste and being vegetarian very limited. However it is what you would expect on these typical trips. Besides that a great day. Highly recommended,quick to respond to all our questions. Would definitely recommend anyone to book with them. £100 deposit online and the rest you pay in cash on the trip. Certainly a good option. I brought my 10 year old daughter to Cairo for the day and I couldn’t have had a better experience. All the sighs we visited were interesting and our guide very knowledgeable. I felt safe at all times and enjoyed every minute! I will be back! It’s a very long day, but extremely worth it. Flying (rather then driving) does seem to be the way to go – the airport transits are very quick on both sides. Mohamed and Ahmed were both extremely warm and hospitible – I particularly enjoyed the Egyptian House music (I believe that is available on request). As an improvement, I think there should be a bit more inclusion for the visitors to edit the itinerary. I was never interested in shopping at the perfume / paparyus shops, and for me that was a wasted hour of the day. Everything else was excellent though – the Museum provided a fantastic insight into ancient Egypt, and going to the markets in the evening gave a fantastic snapshot of contemporay Egypt. Overall, I learnt a lot and had a very enjoyable day. No doubt an excellent service. Thoroughly enjoyed the trip and Mohammed, our tour guide, had very good grasp of English language. Highly recommended. Our party of 4 booked this Day trip to Cairo from Makadi before we arrived for our vacation. The actual booking was easy and the response times very quick and we were given clear and what proved to be, accurate information before our arrival in Egypt. On the day of our trip we were met at our hotel in Makadi Bay at 04.00hrs and transferred to Hurghada airport for the 65 min flight to Cairo. Once at the other end we were met and greeted by our lovely guide Ibrahim who proved to be extremely knowledgeable and patient. Our driver Hamed was amazing! His driving was superb and we felt safe and secure all through our road trip even through the crazy streets of Cairo which is an experience in itself! First stop was the Pyramids and the Sphinx, an early morning start made for the best time to visit with lesser crowds and the best light for photographs. Ibrahim gave us a brief history and gave us as much time as we needed to take in the wondrous sights. We had lunch on a floating restaurant on the Nile, not the best food ever, but it was edible and gave us the opportunity to relax and refresh. Our trip included a visit to a local Egyptian perfumeriey. Although this was interesting, on reflection, our party would have preferred to have skipped this in preference to having more time at the Egyptian museum. At the museum Ibrahim showed us many fantastic and incredible sights and his knowledge was remarkable. He was interesting and attentive and he looked after us extremely well. The museum was busy and it’s so vast and overwhelming and amazing. Cairo museum is not to be missed and having a guide like our Ibrahim just added to the fascination. This day trip was utterly fantastic and although there was some reticence on our part before we arrived we found it to be well organised and accurate in its description. We felt safe and we were extremely well looked after. Everything was at our pace and directed at us at a level that we understood and could appreciate. It gave us everything and more that we could have wished and hoped for. Had an amazing day trip with Amany Salem our tour guide. I can’t say enough about how professional she was and informative. She took her time to explain the history of the city and the pyramids. It felt like I was talking to a long lost sister. She was very attentive and considerate of our time and our needs. I would recommend this company for any one traveling to Egypt. Best part of the trip. My girlfriend and I took the day trip to the pyramids. Travel arrangement were comfortable and efficient! We were met off the plane in Cairo by our superb guide Amany who gave us a great insight into the history of the monuments, as well as answering any questions we had. After a day of taking in the sights etc. we were delivered back to the airport by our driver to catch the flight back. Thanks for a great day. We booked this tour of Egypt Tours Portal online. It was well organized, from the booking process to the airport transfers. The excursion in Cairo was very interesting. We have visited many fantastic places there. Our guide Ibrahim was very friendly and polite, has shown good knowledge of Egyptology, and fluency in English language. Besides the Great Pyramids, the Islamic Cairo tour was the second most attractive tourist place in Cairo and it deserves more time to spend on it. 2) The most high quality client-oriented services. 3) The trip was amazing and very interesting. I really recommend these guys, they are fantastic. We bough Cairo trip and desert excursion with Egypt Tours Portal. Everything went great! Transfers were always on time, plane tickets were booked as confirmed & driver was waiting for us in Cairo with the guide Ahmad Kampung, who turned out to be the best tourist guide we’ve ever had. He was very knowledgeable but not boring, he took us around the Egyptian Museum and explained the history using very interesting facts, his English was perfect, he was very flexible with what we wanted to do throughout the day. After the museum we went for a lunch on a Nile cruise, which was a part of the excursion. In the afternoon we went to Giza and to see the pyramids. Not only Ahmad told us great facts bout the pyramids but also took fantastic pictures of us knew the best places to do so. Overall 5* Experice, highly recommended! Not often i write a review so soon after returning but i had to make an exception here. We were met at Cairo airport from our flight from Hurghada on time by Abraham and our driver for the day. If you have ever been to Cairo you need some skill to drive all day without an accident which i am able to report did NOT happen. Abraham, who was very knowledgeable about Egyptian history and the city took us to the Cairo museum, the pyramids and the Sphinx . Everything was perfectly organized and we felt very safe and secure both with the driver and the guide. Nothing was too much trouble and the view from the restaurant we had lunch in was to die for(the food was excellent too). Due to our flight being moved to a later time by egyptair Abraham arranged for us to visit the markets and mosques so we were not at the airport 4 hours earlier than we needed to be which was brilliant and was above and beyond. This trip was excellent, I wouldnt hesitate in recommending this to anyone,A big thank you Abraham when we return we shall look you up again………..
Pyramids at Giza and that is exactly what we did. Right from pickup at our hotel in Sahl Hasheesh everything went exactly to plan. We were greeted at the airport by the very helpful and knowledgable Yasser and a very safe driver. It really was a perfect day from start to finish and a big thank you to all. Not sure a review can possibly put to justice the INCREDIBLE day I have had with Egypt Tours Portal, and more specifically with HALEMOO. I almost didn’t go to Egypt due to family members and media portrying it as very unsafe. Now, after being there, i wish i had gone much earlier!!!!!!!!!! I chose a day trip from Hurghada to Cairo, and after reading numerous good reviews decided to book with this company. Ahmad wrote back in a few hours, possibly even less and arranged everything for me, including my flight ticket. I was collected at my resort at 5:15 am by a lovely gentleman in a air conditioned van who drove me to Hurghada airport. Upon arrival at Cairo aiport I was picked up by the most AMAZING, friendly and reassuring gentleman by the name of Halemoo. After being with him for a few minutes all my worries were gone. He had a driver in a air conditioned van waiting for us eveywhere. I was provided with fesh bottled water and maximum attention. All my questions were answered and Halemoo made it very clear that he would do anything to make me happy and have the best time ever in Cairo. We went to the Egytian museum , which was just awe- inspiring…truly brining history alive. Halemoo has such an astounding grasp on history and was teaching and explaining to me indepth background on all the art, ancient usages ad customs of the Egyptian people. Halemoo was a hisrory teacher in his past so his knowledge is WONDERFUL!!!!!!!!!!! After this we went on a nie cruise, which was very refreshing and scenic and once in a lifetime experience !! !After this lunch at a nile view buffet style restuarant which was good and then we went to the Papyrus museum and finally my favourite part of the day the pyramids¨!!!! Upon arrival I was blown away by these magestic architectural wonders of the ancient world. Contrary to what people have written on forums about being harassed by sellers and camel owners, I did not encounter one such an event. Halemoo sheltered and protected me 100%. I was able to enjoy and revel in the moment and Halemoo was wonderful in that he never stopped to take pictures of me in every possible pose, and at every attraction throughout the whole day. I was worried about not having enough pictures since I was travelling solo, but Halemoo made sure I had probably about a hunred or more of me at the attractions!!!! awesome. I would recomment everyone to see the Pyramids of Giza atleast once in their life as i have travelled world wide, but never felt such a WOW. Did a camel ride and paid 250 pound to the camel owner and 50 extra for a tip…It is possibly expensive, but so Worth it!!!! After this we went to a traditional oïl factory which uses oils from flowers and plants grown in the SIWA oasis. It was very interesting to see and smell thèse exotic plants and spices but I did not purchase anything and felt no pressure to do so. While i was experiening the oils, Halemoo secretly went next door and bought me 3 huge dates containers and 2 traditional teas boxes!!!!! I was truly blown away in all senses by this hospitality as I had only mentioned to him my love of arabic products, especially dates. He gave them to me as a gift ( was a large bag full) and I cannot emphasize enough what a gentleman this man was. He invited me and my husband ( who was not with me but working this time 🙁 ) back to visit his family in their tradiional village home where he originates from and we will definitely do so!!!!! I was taken to the airport and then Ahmad first called on Halemoo’s phone to talk to me and make sure all my dreams ame true…oh and did hey ever!!!!!!! I cannot recommend this comapny more to anyone. Halemoo was like an angel and made me feel like royalty throughout the whole day. His hospitability is impossibe to do justice to merely by writing. But THANK YOU for giving me this experience in the most luxurious, and comfortable manner and keeping me safe like precious cargo. YOU ARE AMAZING!!!!!!! CANT WAIT TO COME AND DO MORE TOURS OF OTHER PARTS OF EGYPT WITH YOU!!!!! My boyfriend and I have just returned from an amazing holiday in hurghada. We booked the day trip to Cairo by plane with this company having seen all the excellent reviews on here. All emails where replied to almost immediately and the booking/ deposit payment was a smooth and easy process. On the day we was collected from our hotel and driven to the airport. A nice 1 hour flight later we arrived in Cairo and was greeted by our guide Abraham (I hope that is correct). We was taken to our private car/bus and introduced to the driver, Mohamed. Abraham then explained how the day would pan out and insisted that we let him know if we wanted to change or move anything about. Firstly we went to the Egyptian museum which was massive. Abraham was absolutely excellent, his knowledge was very impressive and you can tell that he is very passionate about his country’s history. We was in the museum for a good 2 hrs. We chose to visit the mummy rooms which was £10 each (very over priced) in hindsight would have given it a miss. We was then taken to the Nile for lunch on a boat restaurant. We was served a mini meze, followed by chicken and rice and dessert – way too much food but all delicious. Abraham stopped on the way to buy us some drinks to save money on drinks in the restaurant. Very thoughtful. Next we went to the pyramids – totally amazing to see – how was they made?!?! Again Abraham knew his stuff and answered all questions we had. We went inside a small pyramid – OMG! Very hot, very tight and very uncomfortable but it was an experience. We then moved on to the Sphinx. During the whole trip Abraham took great pleasure in taking lots of pictures for us which was perfect. I had asked for a visit to a market to be added to the trip so next we took a drive to Khan El khalil bizaare. On arrival I felt quite nervous as it was very local and very busy. Without asking (which I would have) Abraham got out of the car with us and explained that he would walk nearby us and that we was to look at what we wanted and enter shops only if we wanted to be reassured that he will always be nearby. This made me feel very relaxed. Once we was ready to leave Abraham called Mohammed who came and collected us. We was then driven back to the airport to catch our flight home. Mohammed was an excellent driver (one of the only ones in Egypt I think). Abraham was excellent all day. During the drive back to the airport the owner of the company called Abraham to speak to me and Paul and check that out day has all gone to plan and that we where happy with everything, this was a nice touch. Overall a fantastic day that we will never forget and I am extremely happy that I chose to use Egypt tours Portal for this trip.